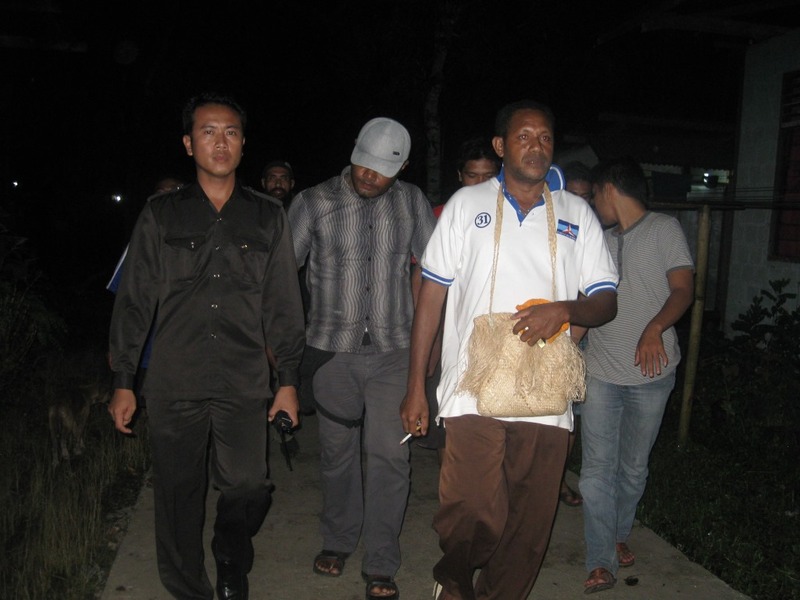 At 8pm on the 25th of September 2013 in Serui, Yapen Island, members of police, mobile brigade, military and Detachment 88 complete with weapons made a forceful arrest of former Papuan political prisoner and organsiser, Edison Kendi. Edison’s family watched on, unable to do anything but witness the brutality carried out by the security personnel against Kendi. He was taken to the Serui Police station and interrogated. At 11pm police continued to destroy property around Kendi’s house while looking for documents thought to be related to the Freedom Flotilla, however nothing was found. The next day, 26th September 2013 several thousand people did a pick-up at the Serui airport, and walked to Mantembu, as a thanksgiving worship to welcome the arrival of ashes and water that were taken to Yapen Island by Frans Kapisa. Two people who intended to come and participate in the thanksgiving were Demmiamus Brumi and Nataneal Karubaba, however they were prevented from exercising their freedom of expression and obstructed by security personnel, forcefully arrested and taken to the Serui Police Station, according to credible but anonymous sources. As the thanksgiving was taking place, the security forces forcefully dispersed the crowd, threw away all the food that was provided by the community in Serui, according to witnesses. The situation escalated into panic according to organisers, several of the participants and organisers protected Frans Kapisa and brought him to a place which they judged to be safe. 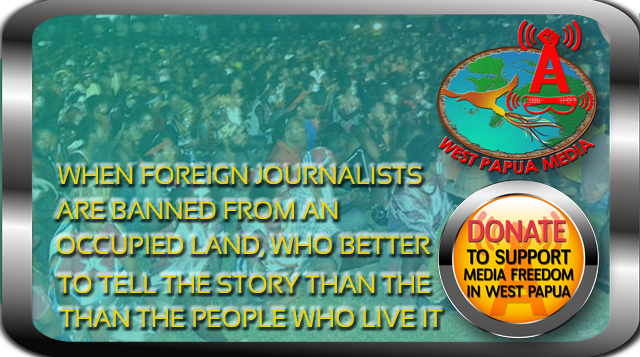 According to sources for West Papua Media, “Not only the participants were victims of the police brutality but also the whole community of Yapen Island. At that point in time the people where not able to carry out any activities whatsoever. The District Police Chief (Kapolres) also instructed his forces to fire should there be any resistance from the people. After 8pm, 3 of the people arrested where released, namely Edison Kendi, Demianus Burumi and Natanael Karubaba. Eduard Paririe, a Papuan activist in Yapen told West Papua Media, “that whatever the security forces (do) against the people does not diminish their will to struggle and demand justice in the land of Papua. 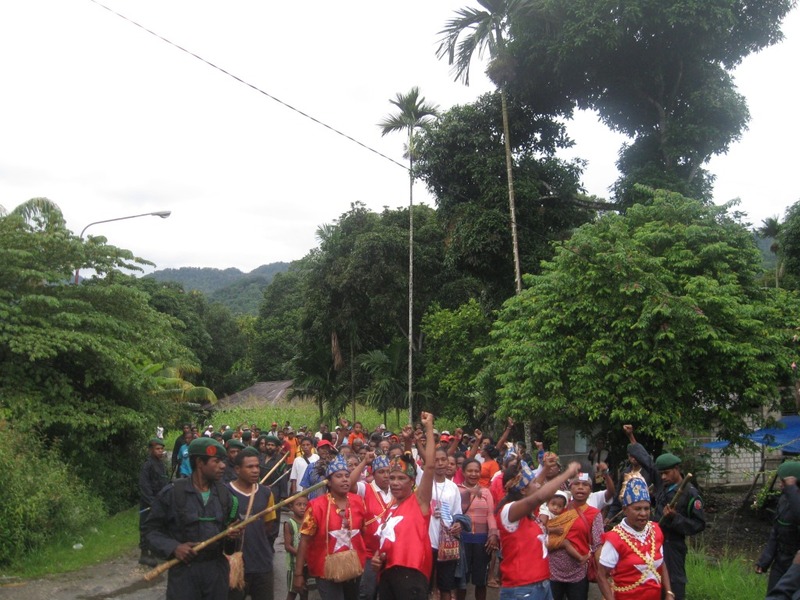 The situation has begun un 25 September 2013 as West Papuan National Authority activists heard on Radio Republik Indonesia that the chief of police in Yapen had prohibited all Papuans in Yapen from taking part in a demonstration planned for 26 September. The police under the command of the head of Criminal Investigation [Kabag Reskrim Polres] arrested Edison Kendi (40 years old), a political leader of Papua Merdeka at his home at 8 pm. This action involved twenty policemen who were not dressed in their uniforms, together with two members of Kopassus. Some of the police were armed with M16s and pistols and were travelling in Avansa 2 vehicles, one of which was black and the other two were white, together with a patrol vehicle. The police said that these people had been arrested because they had not been granted permission to undertake this action and moreover, the group in question is not registered with the National and Political Unit as is required by the Law on Mass Organisations (Ormas) . They were intending to hand over the holy waters to the Aboriginal People from Torres Straits and were accompanied by Drs Frans Kapisa. Edison Kendi was arrested in accordance with a warrant issued by the police in Yapen and signed by the head of the unit. Edison Kendi was taken to police headquarters to be interrogated. This interrogation is still continuing. Following the arrested of Edison Kendi, more police arrived in two trucks to search Edison’s home, hoping to find evidence against him such as documents of Papua Merdeka. This happened late at night, at 10.22. 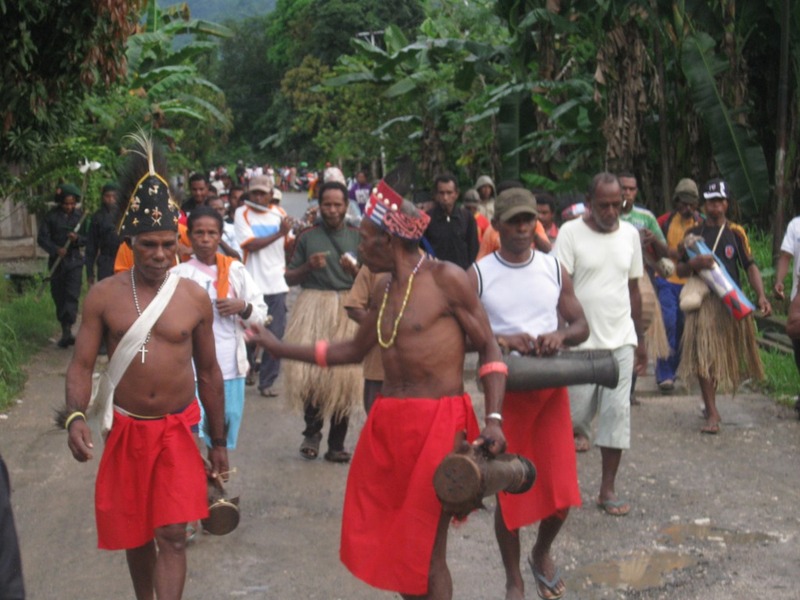 On 26 September at 7.12 in the morning, the Yapen police force carried out sweepings and arrested Demianus Buruni while he was on his way to the Serui Airport where he was intending to take part in welcoming Drs Frans Kapisa while was bringing the holy waters and dust from the Aboriginal people. The other reason for Demianus’ arrest was that he was carrying a Morning Star flag. At the time of writing this report, Demianus was still being interrogated. At 11.34, a joint force of the army and the police in Yapen led by the chief of the military unit and the chief of the police force went to the place where the proceedings to hand over the holy waters and dust from Aboriginal people in Mantembu were due to take place. The army and police also ordered the people there to disperse and to vacate the area where these activities were taking place. They also ordered the arrest of Dra Frans Kapisa and Markus Yenu. Subsequently however, the local people were able to free these two men. At the time of writing, the security forces were on guard in the area where the command post of Papua Merdeka in Kampung Mantebu is located. Reblogged this on freedom flotilla.